Because of its ubiquity, buyers have grown wary of branded content, and so they easily tune it out. What they do respond to, however, is authentic content generated by your most valuable asset—your customers! User-generated content (UGC) is essentially any content related to your brand that is voluntarily produced by your customers. Customers who have good experiences with your brand are motivated to inform their peers by sharing their experiences. UGC provides relevant information without trying to sell anything. This may include product and site reviews, their questions and answers, and pictures of them using your product. Today’s buyers expect detailed information, faster processes, and personalized content, and UGC allows businesses to tap into these expectations by amplifying their customers’ voices, increasing brand visibility, and building relationships. Today’s buyers trust content from other buyers more than they trust branded content because it comes across as more honest and reliable. In fact, 88% of consumers trust online reviews as much as personal recommendations, according to a BrightLocal study. There is never a bad time to show the world how happy your customers are, especially with UGC that authentically conveys your brand. Clearly displaying your customers’ reviews, photos and videos, and questions and answers gives your buyers immediate access to information on specific pain points and concerns that they may have. 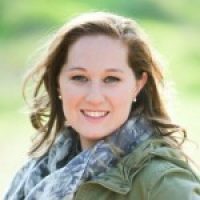 This user-generated content can be shared across your different channels, including emails to your customers, your social media channels, and throughout your website. 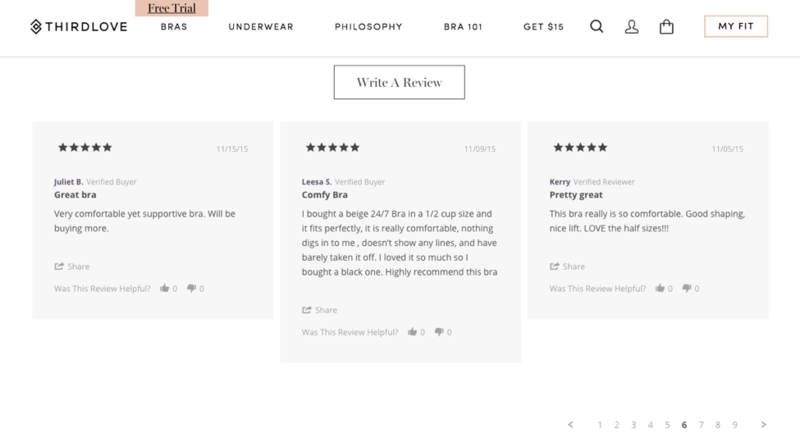 For example, online lingerie company ThirdLove features customer reviews on their website and in their emails to highlight what real women think about their products. UGC like this can alleviate the inherent uncertainty associated with online purchases. The more people are exposed to positive experiences and relevant information about your products, the more likely they are to trust your brand and purchase from you. And with customer photos, you can reassure your buyers what your products look in real life, outside of a studio, and demonstrate how they’re being used. This establishes trust in your brand, which makes your buyers more excited about your products and ultimately leads to more conversions. 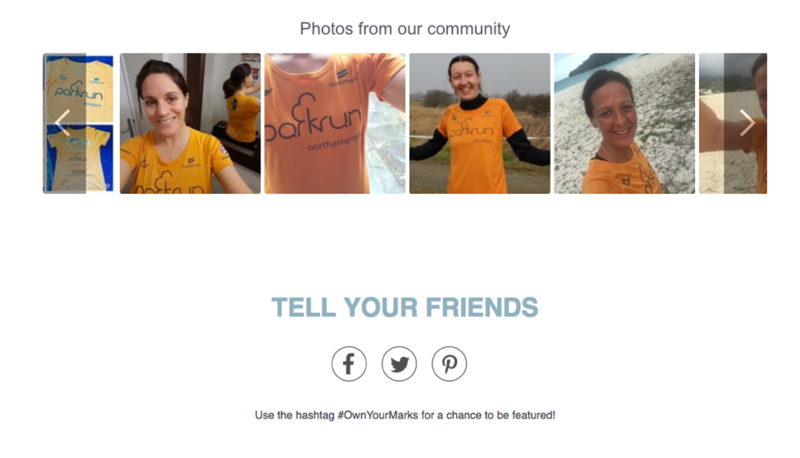 Sportswear brand Tribesports uses a UGC campaign with the hashtag #OwnYourMarks to collect customer photos, which they display on their product pages. These user-generated photos show the enthusiasm of the Tribesports community and encourages others to join. User-generated content is a powerful tool for building social proof, and it’s one of the most effective ways to build trust on social media. Having high brand visibility on social networks increases the likelihood that your product or service will be top-of-mind for your customers when they need something you offer. And when you take the extra step to build a relationship with your customers outside of your store and website, they are more likely to refer their friends and family to your brand when the time is right. By running a contest, encouraging customers to use a given hashtag in posts about your brand, or a combination of the two, you can gather valuable insight about their preferences and interests, while also collecting UGC that can be repurposed across your marketing channels. 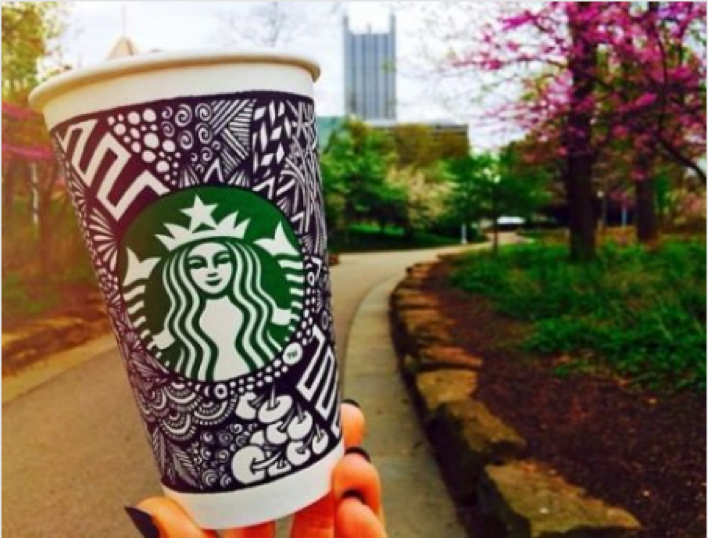 One of the most well known UGC campaigns is the Starbucks White Cup Contest, which encouraged Starbucks customers to cover their signature white cups with their own design and share it on social media with the hashtag #WhiteCupContest. The winning design would be produced by Starbucks as a limited-edition reusable plastic cup. By providing an incentive tailored to their audience and encouraging creative expression, Starbucks created a conversation around their brand and collected thousands of customer photos via social media. At the same time, they showed that they genuinely value their customers. Another way to increase brand visibility on social media is with social ads that broaden your brand’s reach and influence potential customers. However, there is a right way and a wrong way to do it. Often, staged social media ads stand out like a sore thumb among the candid content that visitors consume when browsing their feeds. However, by including UGC within ads, you can improve conversions because they blend in better with the surrounding content. 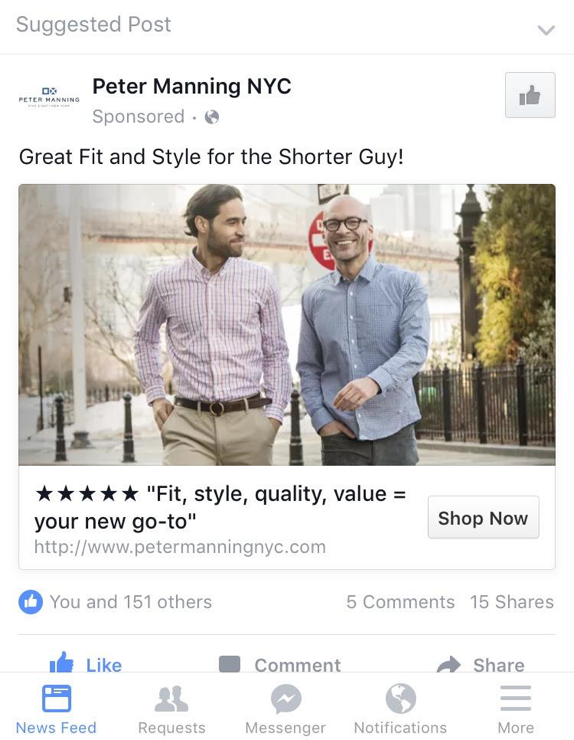 Take for example this Facebook ad from Peter Manning that displays a five-star review. The visual of the five stars and the brief, but relevant review communicates the customer’s positive experience quickly and easily for those scrolling through their Facebook feed. Addressing customer reviews is critical to highlighting your brand’s values and providing good customer service. And customer service is critical to business growth when you consider the fact that for every customer experience failure, brands lose an average of 65% of the revenue they would have earned from the affected customer during the following year, according to SDL. Even if the reviews are negative, this isn’t necessarily a bad thing. Displaying critical reviews on your website shows that your brand is honest and transparent, and it’s an opportunity to let your quality customer service shine. In fact, SDI reports that 30% of consumers say that they would go back to a brand after seeing how business has improved. Responding to negative reviews simultaneously allows you to open up a conversation with your customers and shows interested shoppers that you value them. Answering customer questions is also a great way to address specific customer pain points and influence their purchase decision process. 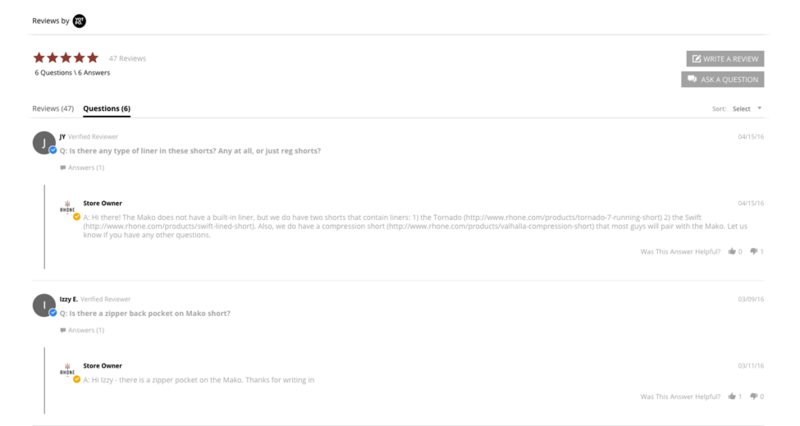 Take a look at the example below of the Q&A section on men’s apparel brand Rhone’s product page, where interested shoppers can ask questions regarding their exercise apparel. Rhone responded quickly, putting their quality customer service on display, and when the answer was “no,” they used the opportunity to direct the customer to products that addressed the concern. You can answer the questions directly as Rhone did or you can refer the questions to a past buyer to answer. Referring customer questions to past buyers adds a social aspect to Q&A, thereby fostering a sense of community around your brand. User-generated content is relevant and relatable, and you can use it to grow your business. It attracts a potential customer’s attention and makes the online shopping experience more personalized, all while adding to the valuable relationship you’ve built with your existing customers. Have you started using UGC for your brand? Share your tips in the comments below!